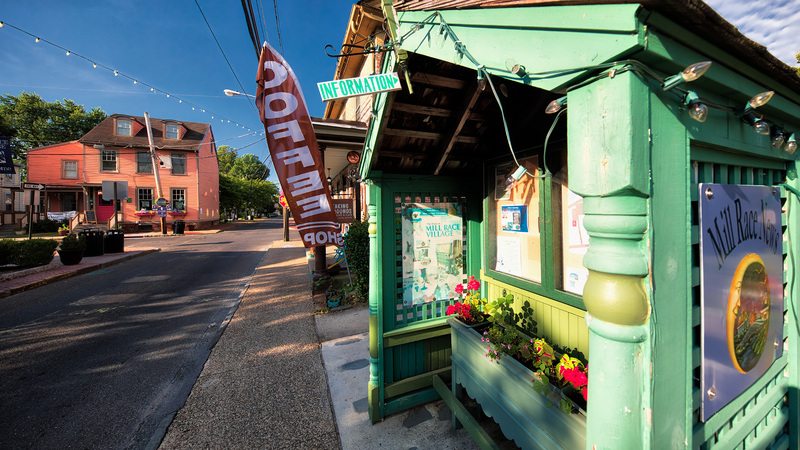 Just earlier I’d missed the very last turn en route the destination: the Breaking Grounds Coffee House, nestled deep the heart of the Mt. Holly, New Jersey historic district. So SIRI had to guide me chaotically all throughout downtown Mt. Holly, making no less than 13 turns, on just as many streets, just to go backwards one block to try that turn again; including down the Main Street which looked straight out of the midwest in the 1950’s, and past the famously haunted Burlington Jail which dates back to 1811 and has been featured on just about every ghost hunting show ever made. I drove quickly, and anxiously past. Anxious not for the ghosts, nor the delicious coffee, but because I didn’t want to be late to meet Dr. Erica Miller and her precious cargo from the Tri-State Bird Rescue. Yet this just couldn’t be right. When Dr. Erica Miller had first suggested the meeting spot, I’d imagined a rest stop on the side of the highway. How would she even know this place existed? And why would she choose this place to handoff the two Falcons? 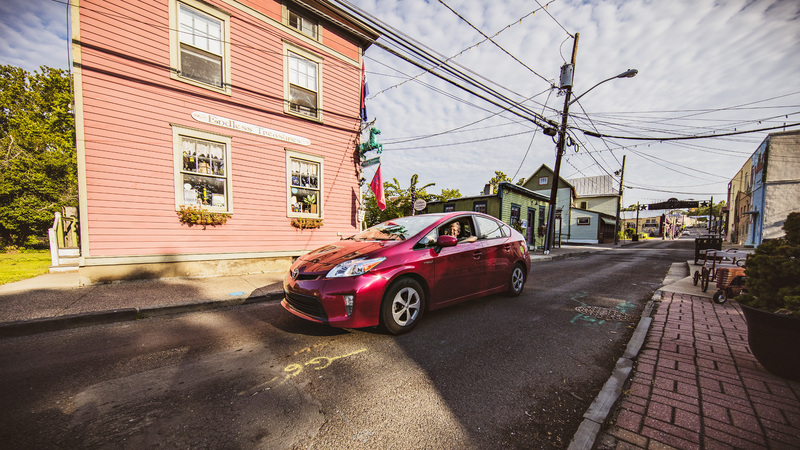 I was just about to phone her with my growing concern that I’d misunderstood the instructions when her tiny, red Prius came silently cruising down the cramped, historic, and lovingly rehabilitated little street. “Google,” she’d soon explain. “I just searched for a coffee place and this was the first I found. It’s cute, huh? 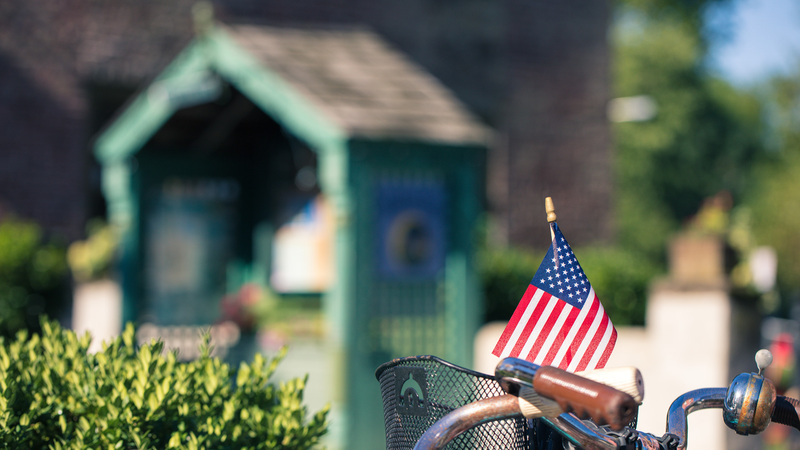 !” We quickly discussed what a quirky little place this was as we got down to business, transferring the precious package from her Prius to the Jeep. A Peek Inside The Package. Even though the two cardboard boxes were folded solidly shut, I just had to peek. 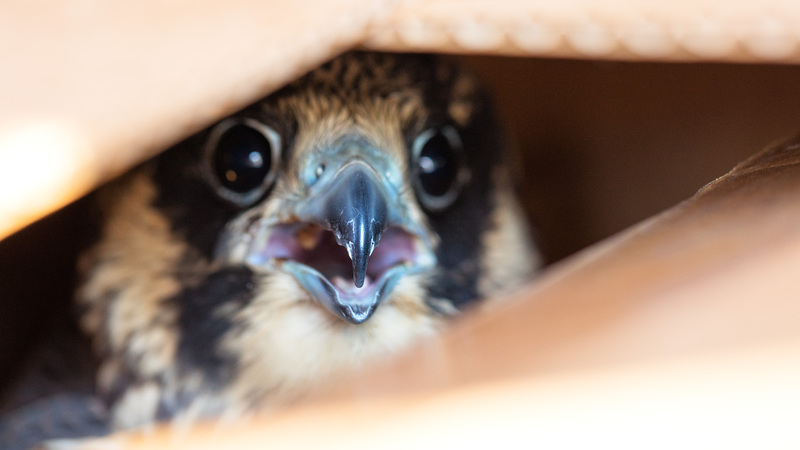 Bending back the cardboard carefully, I simply wanted to be sure the two, full flighted, fledgling Peregrine Falcons had survived their journey from the rehab facility before I took possession of them. We had a long trip back to Long Beach Island. Or at least that’s what I told myself. But really, I just wanted to see them. Because Peregrine Falcon are adorable, and magnificent. When two brilliant, blue rimmed eyes suddenly caught the morning summer sun and flashed in a dark corner of the box, my heart leapt as if I’d seen an actual ghost in the Burlington County Jail, and I jerked my hand back. It was time to go. Ben Wurst would be waiting back at the Causeway. “Freaky” meets Ben Wurst on the shoulder of Route 72 during Saturday changeover traffic. The journey was uneventful, save for a few loud flaps coming from the cardboard boxes, a few strange odors, and the Saturday morning bridge traffic on Route 72. When I had offered to drive the Falcons to LBI, I was so excited that I’d completely forgotten that I’d be driving straight down Rt. 72 during the heart and the heat of Saturday changeover traffic. I pride myself on never making those kind of shoobie mistakes. What’s worse, is it also never occurred to me in the excitement that we’d be releasing these rehabilitated birds at the BOIS Tower in full view of thousands of slow moving beach goers. Package #2 is opened. The reserved “Blue” is confused by the sight of Ben Wurst, and Long Beach Island. But she’ll be right at home here. After all, she’s from Philly. 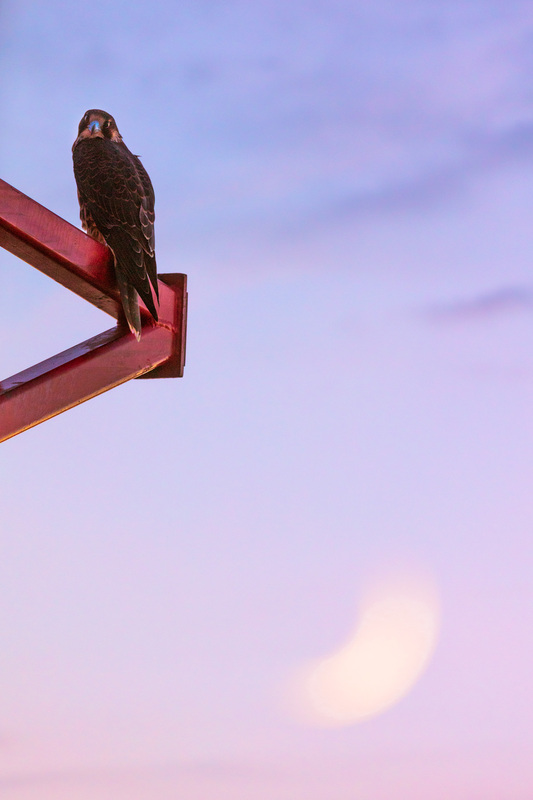 “Freaky” the rehabilitated Falcon was born earlier this summer on a water tower in Atlantic City. Unfortunately, on her first attempt at flight, she landed right in the middle of a busy street where she simply sat frozen with confusion. Kathy Clark came to her rescue, quickly banded her for tracking, and then went to let her go in a safer place closer to her nest. But when Kathy put her down, Freaky didn’t back away as she should. Instead, Freaky just sat and stared. Something was not right. She was apparently severely concussed from the fall. “Blue” was born on top of an apartment building on Chestnut Street in Philadelphia along the mighty Schuylkill River, right around the same time Freaky was born. She was also found on the ground near her fledge date, with a severe keel fracture and suffering respiratory trauma. 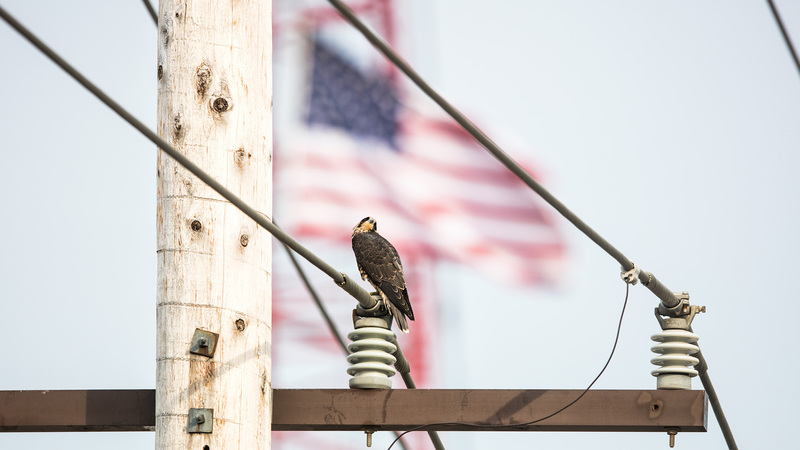 Thankfully, under the expert care of Tri-State Bird Rescue, both Falcons fully recovered. 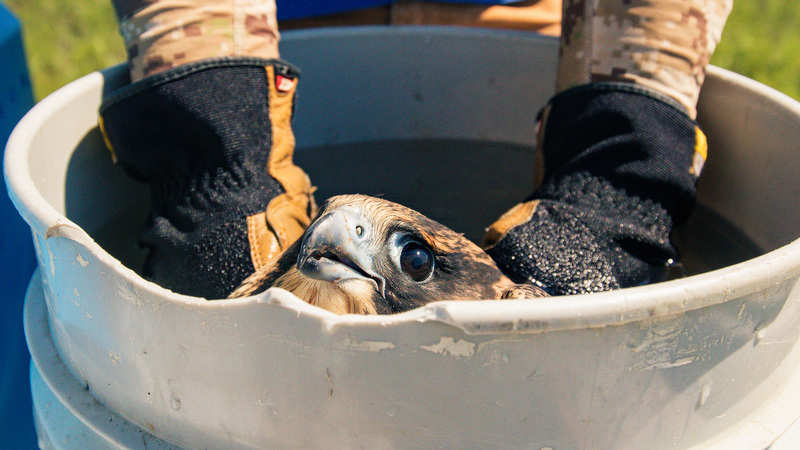 They spent their final days at rehab in a special flight cage, for the time they spent being rehabilitated was the most critical time for any young Falcon: it was fledge time. Both birds had become “fully flighted” during this time, learning to fly while at rehab. But neither had yet the chance to test their newfound skills in the real world. They were clearly no longer babies… but they weren’t quite adults either. Their chances of survival on their own, and in the wild, were slim. 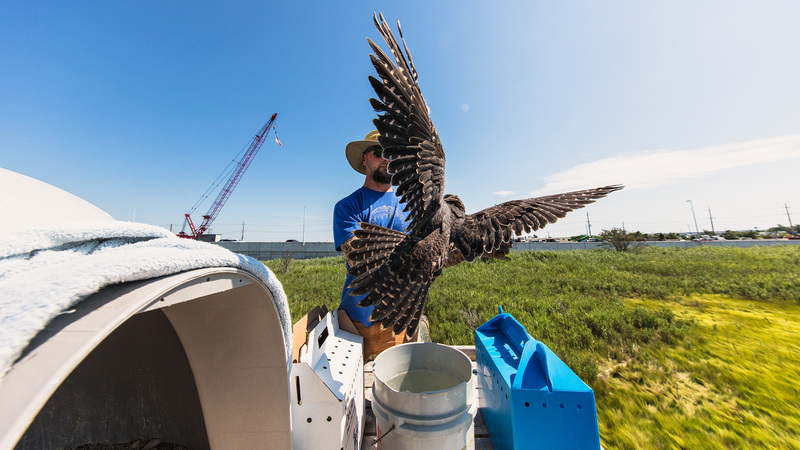 As successful as their rehabilitation was, there are few good options for releasing these two, and many other birds like them, back into the world. 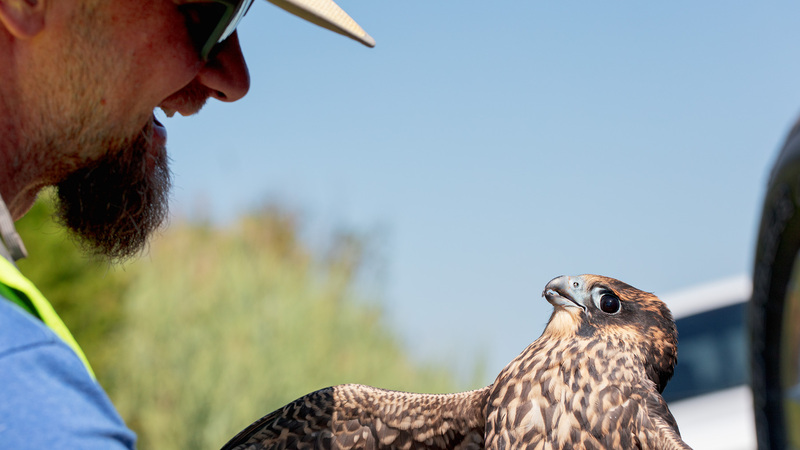 Normally, a rehabilitated baby Falcon would be released back to its “natal site”; the place where it was born. The problem with both Freaky and Blue is that all of their other siblings had already grown up and flown away while the two were being rehabilitated. If they were released back at their original nests now, their parents would most likely perceive them not as their beloved offspring, but as intruders, and as threats to their territory. Their parents would probably, literally, kill them. To make matters worse, these two were technically fledged, and full flighted, but still had no real world skills. While Falcons, like most animals, have deep rooted instincts, instincts are kind of like learning physical things by reading about them books. It still really helps, and indeed, is probably necessary, to see someone experienced in action doing those things you are trying to learn. Young Falcons learn many important skills by watching their parents. Freaky and Blue would have no such opportunity. That is, unless Jo Durt & Bridgeboy at the BOIS Tower on LBI would be willing to take them in. Blue gets a dunk in the bucket. 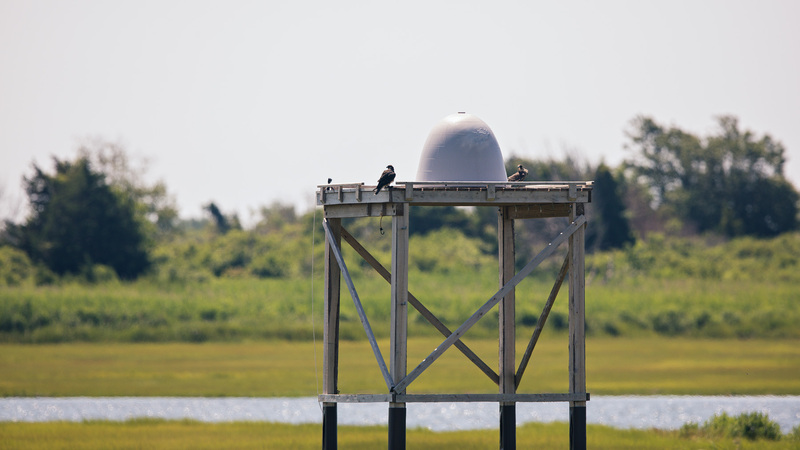 And so it was that Long Beach Island’s BOIS (Bonnet Island) Tower was chosen as the perfect place to attempt to release them. Or, more accurately, to “foster” them. While the two adults, Jo Durt & Bridgeboy, were not exactly experienced parents, their sole offspring Blue Bonnet was the same age and level of development as Freaky & Blue. 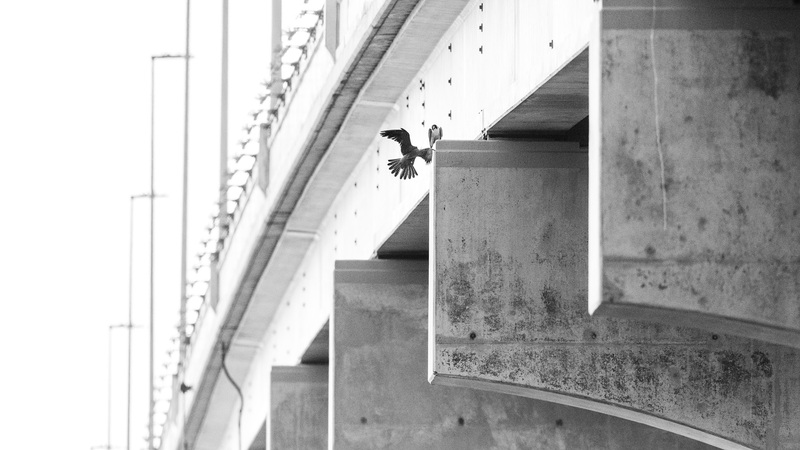 She had only just discovered that she was born to fly so was still living at “home” on the Causeway Bridge with mom & dad. 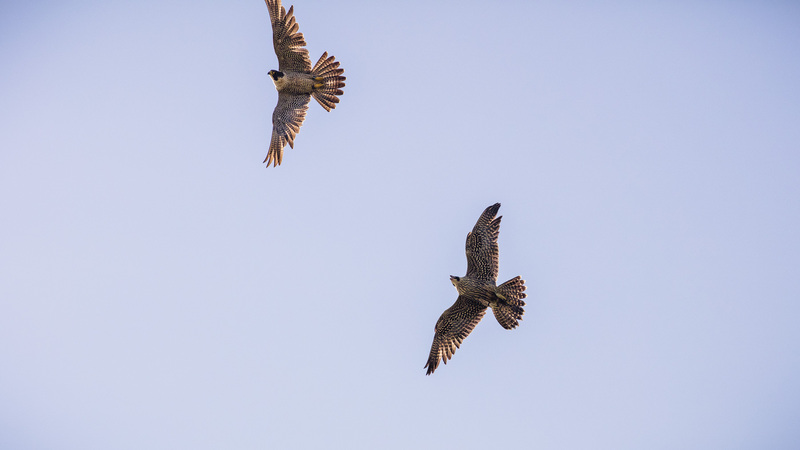 The hope was that, because of this perfect timing, the BOIS Falcon family might be sufficiently tolerant of the two youngsters and help them get a true second chance. Perhaps they would even take in the two fosters as their own. It was certainly worth a try. Not a lot is known about such “late stage fostering” and this was an exceptional opportunity to learn. What is known is that, traditionally, the rehabilitated birds in these circumstances are simply let go somewhere into the wild even though the probability that they will actually survive is extremely low. 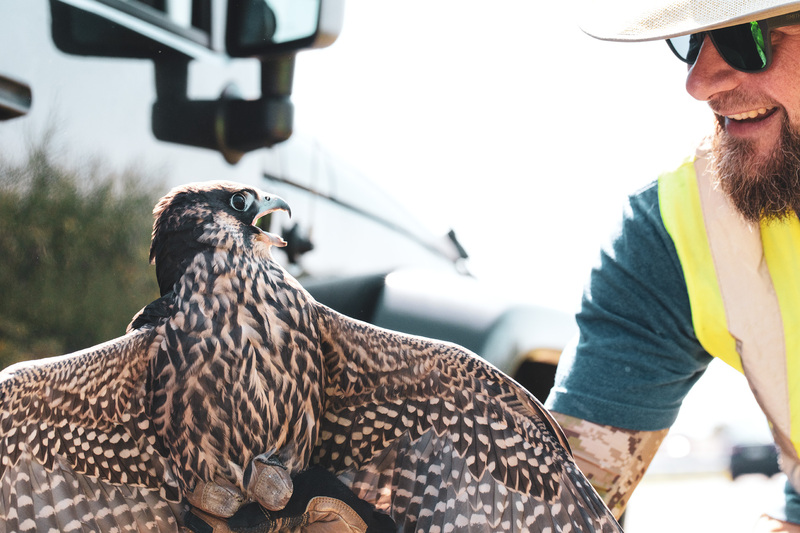 It takes an incredible amount of time and money to rehabilitate a Falcon. So if the end result is that you release such a carefully cared-for bird to a certain death, then it is probably best not to even bother rehabilitating them in the first place. It’s sad. But true. Long time Readers have seen many successful Peregrine Falcon fosterings here on the Readings. We’ve just never seen one attempted this late in the game. Blue and Freaky spend the afternoon drying in the sun on the BOIS Tower. To keep Blue & Freaky from flying away in a panic the moment they are let go, the two birds were soaked in a bucket of water up on the BOIS Tower. The extra weight of the water should keep them from flying for a bit, giving them a chance to acclimate to their surroundings. And it also gives the adults, Jo Durt & Bridgeboy, a chance to asses the situation, and for us to assess their reaction to all of this. For the main fear and risk here, compared to a traditional release, was that the two youngsters would be seen as intruders rather than fosters by the adults. There was a small, terrifying possibility that Jo Durt might actually murder these two. So a small team of observers was positioned to monitor carefully, fully prepared to intervene if things happened to turn south. 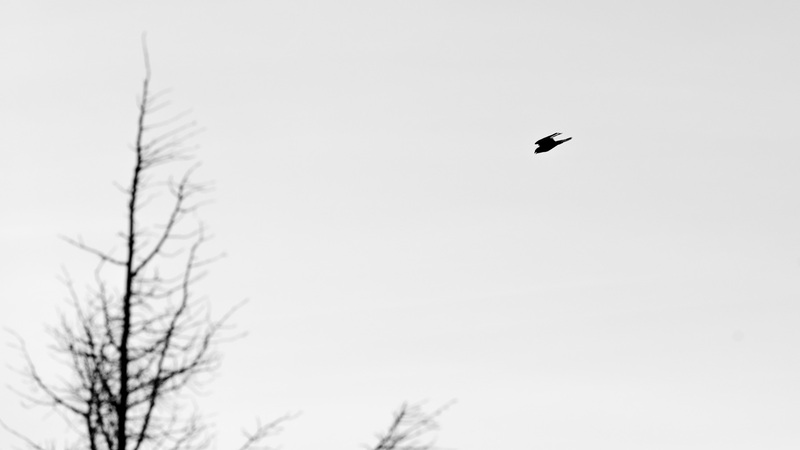 Jo Durt takes the crane, watching and calling to the mysterious fosters from a distance. It only took a few minutes to put the worst scenarios to bed. 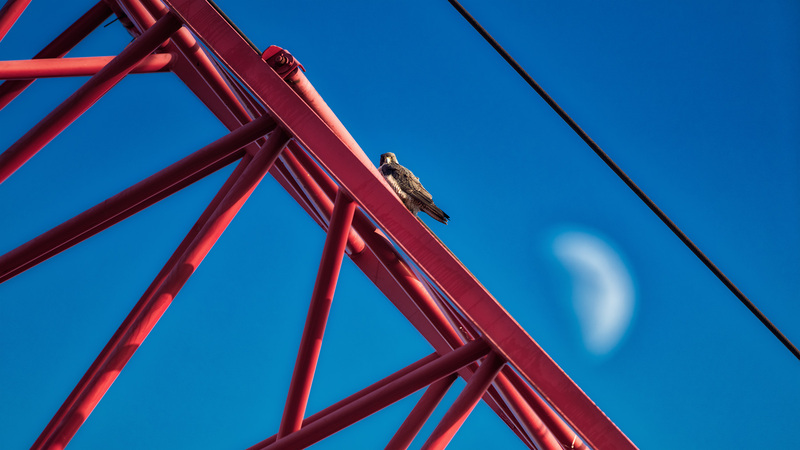 Just a minute or two after the release, Jo Durt landed high atop a construction crane and began to calling to the two young fosters. What she meant by those calls is not entirely clear. But whatever she meant, she clearly was allowing them to stay on the Tower while they dried, and, by the evening, had begun attacking us to once again protect her Tower and now the two, new, soaking wet fosters on top of it. As evening sets, Jo Durt swoops in to meet the foster babies. “MAMA???!!!??? ?” Freaky immediately begins to chase Jo Durt, begging for food. The more reserved “Blue” takes flight and begins exploring Bonnet Island on her own. Freaky meets her new foster sister Bonnie, and the two begin exploring together. For a few days there, Bonnie had the sibling she always wanted, but never had, since she was the only one of the four BOIS eggs to successfully hatch this season. The release had gone flawlessly and within a few days the fosters were clearly settled into their new home on LBI. The crazier and more immature “Freaky” chose to spend her time hanging around the family on the bridge, begging Jo Durt and Bridgeboy for food, and playing with her new foster sister Bonnie. “Blue” kept to herself more, exploring Bonnet Island and practicing the hunt. 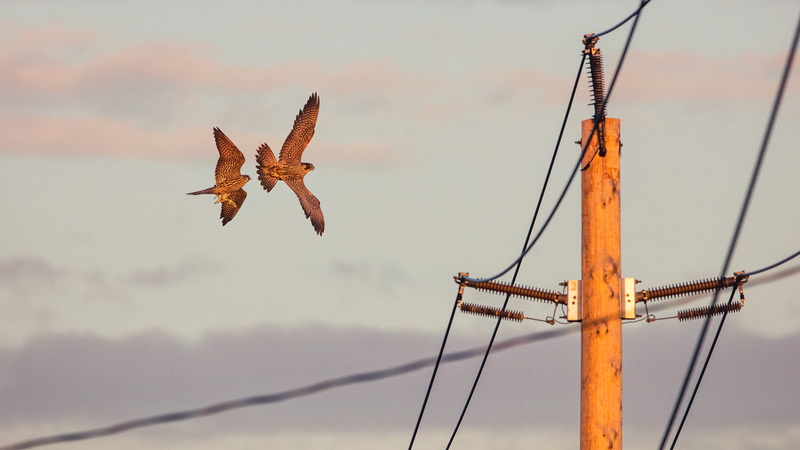 They were responding differently, but equally successfully, to their second chance at fledging. And the Durt family was showing their Island hospitality and willingness to help someone in need. Everything was going so well. Then, tragically, just a few days later, Bonnie would be fatally struck down in traffic. Life is not easy for a young Peregrine Falcon. In the best cases, a young Falcon has a 50/50 chance of surviving the fledge stage. At many sites, they have a zero percent chance. 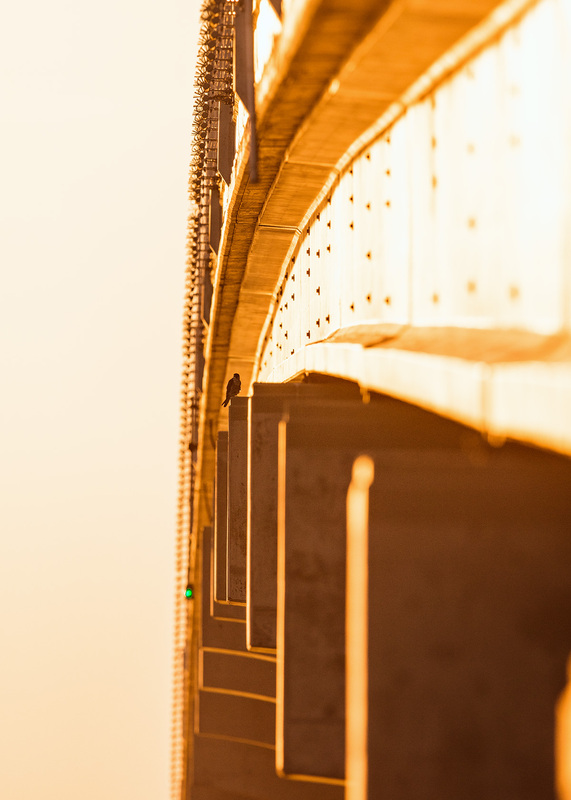 The Causeway Bridge already had a 100% failure rate. 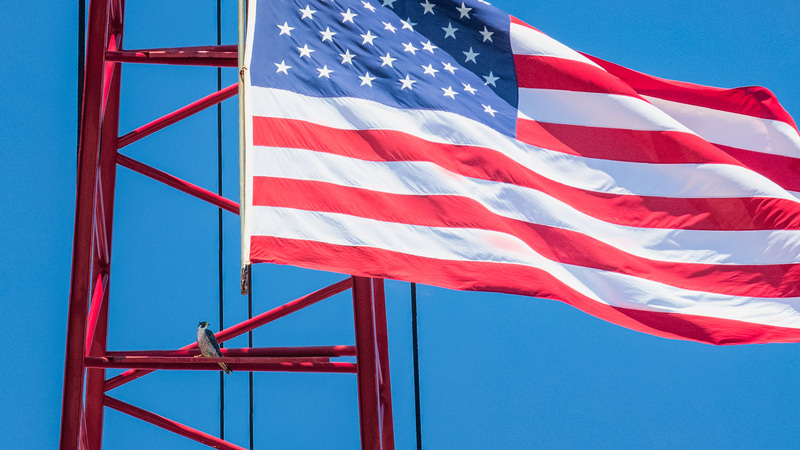 Bonnie had made it farther in life than any other Falcon born to that bridge ever had before; a feat made more exceptional by the fact that it is a busy construction site. The loss of Bonnie was painful for Jo Durt & BridgeBoy, and for us as well. The photo above is a real scene. In a rare moment, after Bonnie’s death, Jo Durt landed on the same pier as BridgeBoy and roosted right up against him. She began to wail. She wailed for an hour. Her cries echoed off the piers of the Causeway and over the Bay in the stillness of the evening. She wailed so long that BridgeBoy finally couldn’t take it anymore, and flew to the other side of the bridge to be alone. I don’t know for sure what it all meant. But it was absolutely heartbreaking. Blue watches them, and learns how to be a Falcon grown. A Second Chance; for her, for the Durts, for the Causeway, and for us. And Blue? Well, I’m happy to report that she continues to thrive around Bonnet Island. As you cross the bridge you might see her perched atop a telephone pole near the Dutchmans, teaching herself to hunt pigeon and duck, and practicing the things she is learning from Jo and BridgeBoy. 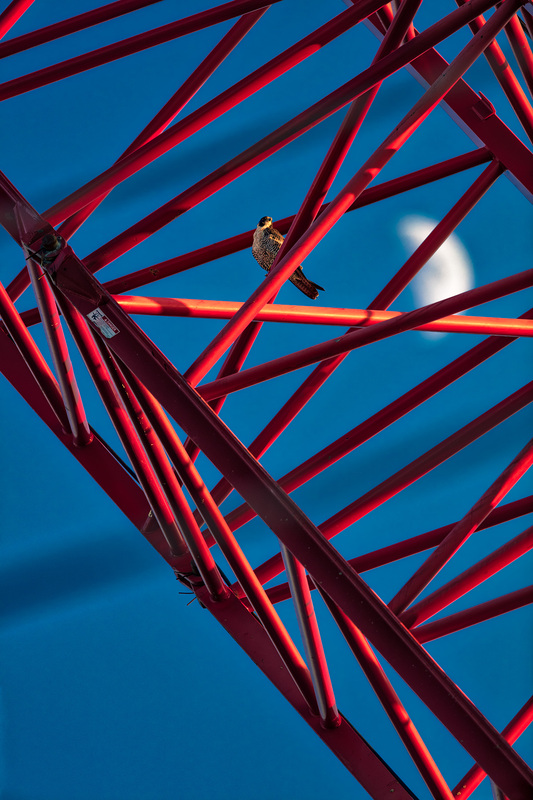 Or in the evening, when she likes to visit the Tower, to watch the adults hunting on the construction cranes. Blue remains with us and is well on her way to becoming an Islander. A Philly-transplant Islander, but an Islander nonetheless. A true second chance. Tri-State Bird Rescue gave her a second chance, and now she is giving us one. She is now our foster baby. Many an Islander has contracted Falcon Fever this summer, driving over the bridge and watching the Igloo on the Tower. The death of Blue Bonnet has struck the Island’s soul deeply. Investing yourself in the difficult lives of endangered Peregrine Falcon is surely not for the faint hearted. But life goes on. Together we navigate the twists and turns of our short lives and uncertain futures. Sometimes we see ghosts of the past, sometimes we discover new, unexpected places. We lose old friends, yet we make new ones. The BOIS Tower is the resurrection of the Shack, just as our Foster Baby Blue carries the spirit of Blue Bonnet across the Island. Cheers to that. To Second Chances. For all of us. And Godspeed, Blue! Super Special Extra Thanks to Kathy Clark and Ben Wurst from team NJ, Art McMorris from team PA, Dr. Erica Miller, Amiee Federer, and Andrea Howey from Tri-State Bird Rescue, to Kai & Randy, and everyone willing to help a creature in need when they can. Posted in Wildlife and tagged blue, blue bonnet, bois, bridgeboy, freaky, jo durt, kathy clark, LBI, Long Beach Island, peregrine falcon. Bookmark the permalink. Bittersweet, beautiful story. Thank you! Thank you so much for following all the stories. I saw the dead Bonnie on the bridge, and and assumed it was from the BOIS tower. Now I know the full story. Such incredible work all the rehab people do and such incredible pictures you take and stories you tell. These little stories just make the day. Thank you! Such a beautiful story and spectacular pictures. Thank you so much for all that you do. so wonderful to know that all was not lost this year for Jo Durt and Brideboy – be safe a godspeed Blue! Such amazing work!! So sad for Bonnie. You’ve helped/ saved so many… hopefully in the future they’ll all make it.! Thank you for all you do!! Following raptor families is full of ups and downs. Thankfully, the ups usually outweigh the heartbreaks. Wildlife rehabilitators are amazing people, who often don’t receive enough praise. Many thanks to all the selfless people involved in this and the many other similar stories!